None, really… She has a remarkably high pain tolerance, though. She is, also, a bad luck magnet. She is constantly falling into manholes, getting struck by lightning, losing her things, breaking her things, tripping, etc. Her bad luck does extend to other people who get too close to her. She idolizes superheroes and has stalker tendencies towards them and Gladstone Gander. She has trouble getting a hint that her presence isn’t wanted. She keeps a scrapbook of all of her meetings with “famous people.” She is very skilled in construction but because of her bad luck, her constructions almost always end up destroyed in some way or another. 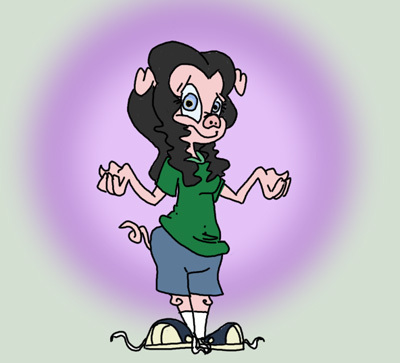 Pebble Sadswine was born with her bad luck. Just two years into her life, she was in a car crash, which killed her parents but kept her alive. Since then, she was raised in an orphanage. Despite all of this, she has remained happy throughout all of her life. It’s possible that she’s incapable of being sad. She finished high school but never went to college. Instead, she went straight to work. Because of her bad luck, she is never able to hold a job down for very long. This has caused her to become self-sufficient. She builds her own house (it’s frequently torn down for some reason or another) and utilizes whatever resources are available to her to get what she needs.